A pacemaker is a small implantable device that treats abnormal heart rhythms called arrhythmias. Specifically, a pacemaker treats slow arrhythmias called bradycardia. Arrhythmias result from a problem in the heart’s electrical system. Electrical signals follow a certain pathway through the heart. It is the movement of these signals that cause your heart to contract. A pacemaker system has two parts, and each plays a role in treatment. 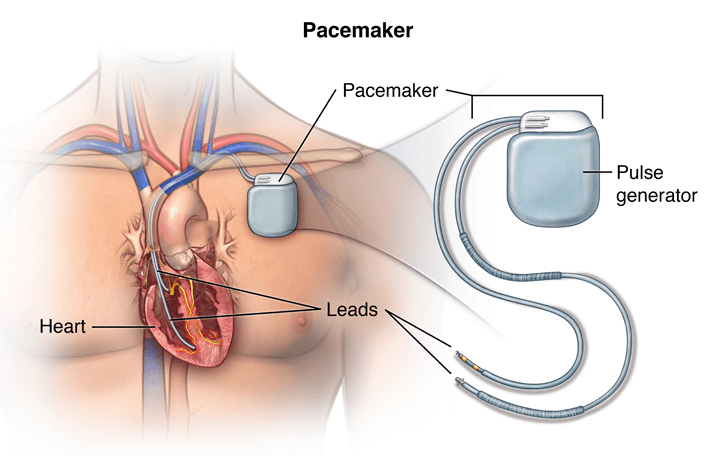 The pacemaker leads are thin, insulated wires that carry electrical signals back and forth between the device and the heart. The leads can sense when the heart is beating too slowly and needs treatment. The pacemaker implant experience can vary from one person to another. Some people stay in the hospital overnight, while others go home the same day as the procedure. There is usually tenderness at the incision site, just as there is any time you have stitches. However, most people have a fairly quick recovery. You may have an appointment a few weeks after the procedure so that your doctor or nurse can make sure your incision site is healing well. Many people with a pacemaker have an improved quality of life since the device helps relieve symptoms of a slow heart rate.